Today’s post is from Pastor Dell Sanderson. This is Dell Sanderson, a tag along pastor from Morris, MN. One of the things that struck me today was a small incident. I’ve discovered that balloons are an automatic indication of play when I blow them up for kids (and for most adults for that matter). In church at home we have a worship service where kids get to hit balloons around during a hymn. They play and the adults join in. At the end of worship the kids can take a balloon home. When I broke out the balloons here most of the kids didn’t play. They scrambled among themselves to get one and then held onto them tightly because they were afraid of losing it. It reminded me that it’s hard to play, feel secure, laugh, and love freely when you are in a survival mode. No doubt they are a reflection of their parents. 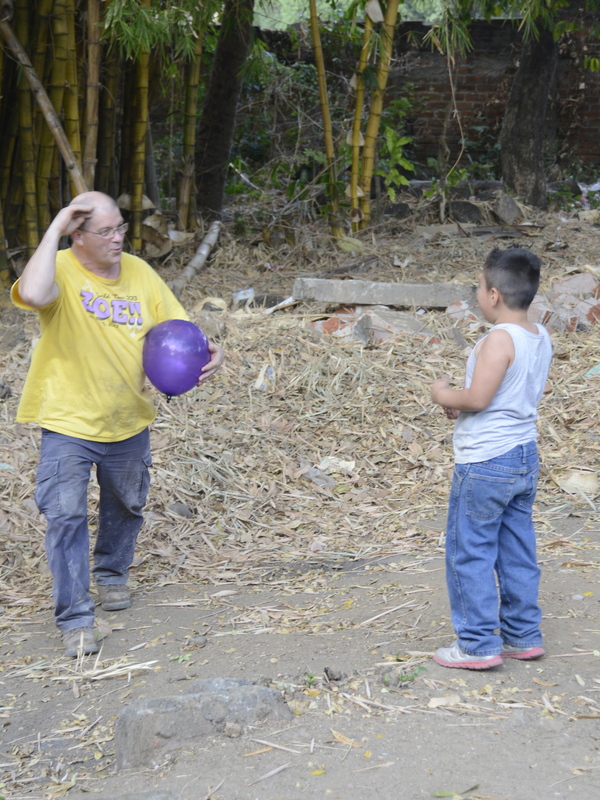 I coaxed a boy, Alexandro, to just play freely for about 10 minutes. We batted the balloon around and found a way that we could press our faces against the opposite sides of the balloon and laugh at each other’s flattened face. I think I heard God laugh too. I’d like to think we can create windows of hope with children and families. I’d like to think that we can help create a space where basic needs are met so children can play and adults can feel at peace in heart, soul, and mind. But I’d also like to think we can learn that just as there is a scarcity of life when you don’t have enough there can be a scarcity of life when you have too much. To play, to receive love, to love, and to give God praise; this is why we have stuff. This entry was posted on Thursday, February 6th, 2014 at 1:14 pm	and posted in The Church in The World. You can follow any responses to this entry through the RSS 2.0 feed. « Having a Little Fun!